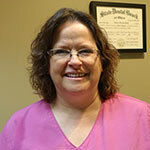 Barb has worked in our office since 1997. She graduated from dental hygiene school in 1987. Barb and her husband Norm have three grown daughters and a beautiful baby granddaughter.